Previous epidemiologic studies have shown that smoking, obesity, and physical inactivity are associated with poor survival following a diagnosis of ovarian cancer. Yet, the combined relationship of these unfavorable lifestyle factors on ovarian cancer survival has not been sufficiently investigated. 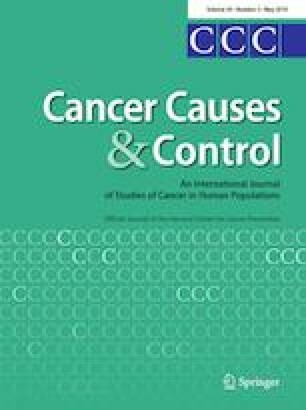 Using data pooled from 13 studies, we examined the associations between combined exposures to smoking, overweight/obesity weight, and physical inactivity and overall survival (OS) as well as progression-free survival (PFS) among women diagnosed with invasive epithelial ovarian carcinoma (n = 7,022). Using age- and stage-adjusted Cox proportional hazards regression models, we estimated hazard ratios (HRs) and 95% confidence intervals (CIs) associated with joint exposure to these factors. Combined exposure to current smoking, overweight/obesity, and physical inactivity prior to diagnosis was associated with a significantly increased risk of mortality compared to women who never smoked, had normal body mass index (BMI), and were physically active (HR = 1.37; 95% CI 1.10–1.70). The association for a joint exposure to these factors exceeded that of each exposure individually. In fact, exposure to both current smoking and overweight/obesity, and current smoking and physical inactivity was also associated with increased risk of death (HR = 1.28; 95% CI 1.08–1.52, and HR = 1.26; 95% CI 1.04–1.54, respectively). The associations were of a similar magnitude when former smoking was assessed in combination with the other exposures and when excessive weight was limited to obesity only. No significant associations were observed between joint exposure to any of these factors and PFS. Joint exposure to smoking, excessive weight, and physical inactivity may negatively impact survival of ovarian cancer patients. These results suggest the importance of examining the combined effect of lifestyle factors on ovarian cancer patients’ survival. The online version of this article ( https://doi.org/10.1007/s10552-019-01157-3) contains supplementary material, which is available to authorized users. The Australian Ovarian Cancer Study Management Group (D. Bowtell, G. Chenevix-Trench, A. deFazio, D. Gertig, A. Green, P. Webb) and ACS Investigators (A. Green, P. Parsons, N. Hayward, P. Webb, D. Whiteman) thank all the clinical and scientific collaborators (see http://www.aocstudy.org/) and the women for their contribution. The cooperation of the 32 Connecticut hospitals, including Stamford Hospital, in allowing patient access, is gratefully acknowledged (CON). This study was approved by the State of Connecticut Department of Public Health Human Investigation Committee. Certain data used in this study were obtained from the Connecticut Tumor Registry in the Connecticut Department of Public Health. The authors assume full responsibility for analyses and interpretation of these data. A.N. Minlikeeva was supported by National Cancer Institute (NCI) NIH/NCI 4R25CA113951 and NIH/NCI P50CA159981; K.B. Moysich was supported by NIH/NCI (2R25CA113951, R01CA095023, R01CA126841, P50CA159981) and the Roswell Park Alliance Foundation; K. Odunsi was supported by the Roswell Park Alliance Foundation and NIH/NCI P50CA159981; J.B. Szender, K. Starbuck, and P.C. Mayor were supported by the NIH T32 training grant T32CA108456; S.J. Jordan was supported by National Health & Medical Research Council of Australia NHMRC APP1061341, C.M. Nagle by NHMRC APP1073898, and PM Webb by NHMRC APP1043134; AUS was supported by U.S. Army Medical Research and Materiel Command (DAMD17-01-1-0729), NHMRC (199600 and 400281), Cancer Councils of New South Wales, Victoria, Queensland, South Australia and Tasmania, and the Cancer Foundation of Western Australia; CON was supported by NIH (R01-CA074850 and R01-CA080742); DOV was supported by NIH (R01-CA112523 and R01-CA87538); HAW was supported by NIH (R01-CA58598, N01-CN-55424 and N01-PC-67001); HOP was supported by Department of Defense (DOD): DAMD17-02-1-0669 and NIH/NCI (K07-CA080668, R01-CA95023, P50-CA159981, and R01-CA126841); JPN was supported by Grant-in-Aid for the Third Term Comprehensive 10-Year Strategy for Cancer Control from the Ministry of Health, Labour and Welfare; MAC and MAY were supported by NIH (R01-CA122443, P30-CA15083, P50-CA136393), Mayo Foundation, Minnesota Ovarian Cancer Alliance, and Fred C. and Katherine B; MAL was supported by NIH/NCI (R01-CA61107), Danish Cancer Society (Research Grant 94 222 52), and the Mermaid I project; NEC was supported by NIH (R01-CA54419 and P50-CA105009) and DOD (W81XWH-10-1-02802); NJO was supported by NIH/NCI (K07 CA095666, K22-CA138563, and P30-CA072720) and the Cancer Institute of New Jersey; OPL was supported by National Health and Medical Research Council (NHMRC) of Australia (APP1025142, APP1120431); USC was supported by P01CA17054, P30CA14089, R01CA61132, N01PC67010, R03CA113148, R03CA115195, N01CN025403, and California Cancer Research Program (00-01389V-20170, 2II0200).